The Weirflex from Red Valve is designed to specifically meet the needs of stormwater and combined sewer systems. The valve features a full-port opening for unobstructed flow when in the open position. To control the rate at which stormwater enters a collection system, the valve is closed from the bottom, creating an adjustable weir. The weir can be closed up to 96% of the total pipeline diameter. This allows operators to adjust for seasonal rainfall changes, wet-weather conditions, storm events or changing population demands. The Weirflex Control Valve is supplied with an electric-motor operator to allow remote adjustment of the valve. The Weirflex has only one wetted part, the elastomer sleeve, making it ideal for remote and inaccessible locations. There are no seats, packing or seals to maintain. Only normal lubrication of the operating mechanism is required. The Weirflex Control Valve can also be remotely operated. 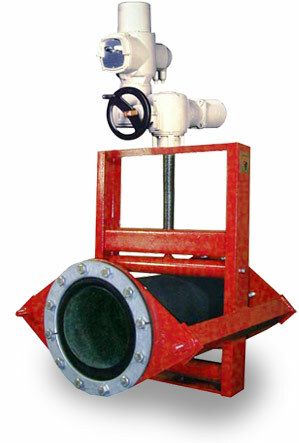 Manual motor or automatic means of operation are available.